I've never had time to play with those online moodboard generators, and so I was just collecting images haphazardly on Pinterest for the past year. As time went on, and I painted various pieces for the cottage, I had these nagging feelings that maybe I should just STOP. I was painting everything random colors with no design scheme in mind. I seriously made decisions just on whatever paint I had lying around, or impulse I was feeling at the time. I worried that I was going to have to go back and repaint everything once the house was built and it was time to put it all together. So today I finally signed up for a moodboard thingie, and slapped down all the pics I had lying around on my hard drive and Pinterest. These are some of my finished pieces, plus my inspiration pictures. it looks like there's already a theme!? Are you picking up what I'm laying down, man? Nobody could be more shocked than I! I still haven't made up my mind about a fridge color. Or a faucet finish. Or a million other things. So worry not -- there are still plenty of decisions to completely flip out over & analyze to death. My specialty. I love it! I know it will be awesome! Love! So fun and it fits you perfectly! I belive there's a story about that patriotic house you posted. 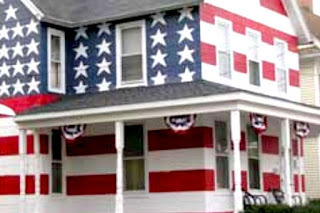 I think I read somewhere - the guy wanted to put up his American Flag for something but his HOA said "no" because of some stupid technicality. I love the particular shade of beachy blue you have going. Americana with a twist! 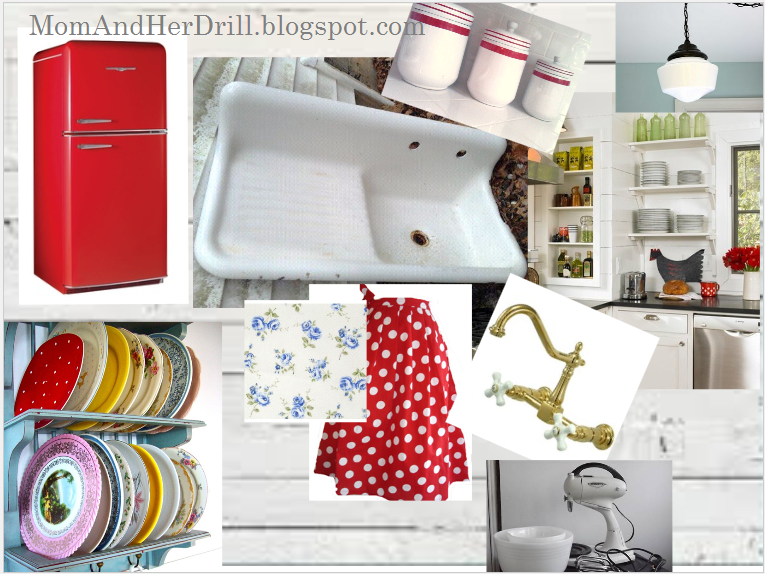 I love the boards, and those refrigerators are to die for! 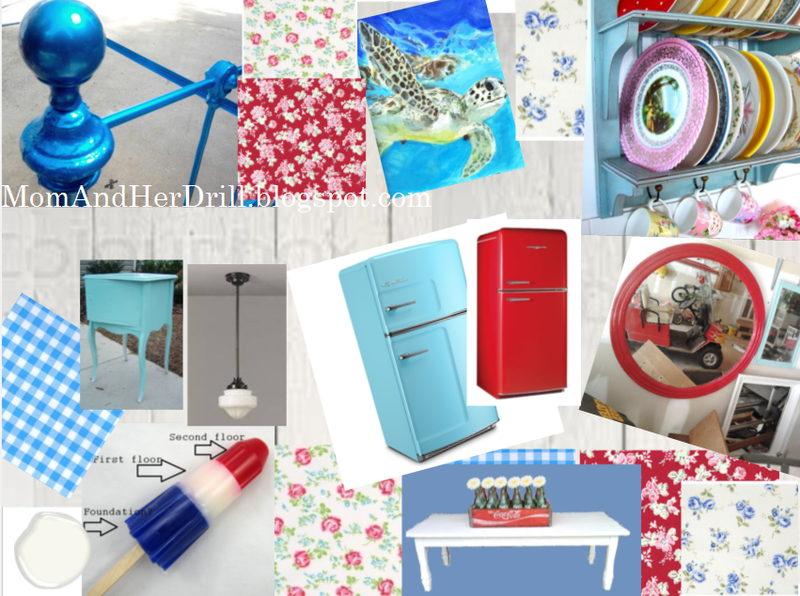 Hey Katy.....Love your mood boards! I might try this. Your colors are wonderful! One thing I have learned about faucets, I will never have chrome again. They look lovely when they are clean, but who wants to clean them every time they are used. I now have brushed nickel in my kitchen and bathroom, and I will never look back. On the plus side, and take this for what it's worth, A guy from the local lumber store told me that chrome is back in and brushed nickel is so last year (insert eye roll), so maybe they will be cheaper! Thanks for your kind comment on our concrete counter-top! If you decide to do this (which I know YOU can), in the not so distant future, you will have an army of help from your kids! That's why I had mine! (just kidding), but they sure do like to help their Momma! Bless them. I've heard that if you just pick things you love, then they become a coherent whole. Looks like that's true for you. I'm so living vicariously as you do this project. love the retro fridge but dang, that price tag is killer. hope you can find one on craigslist or maybe ebay. Love this... Soo excited for u!! !